Last night on SportsCenter, Scott Van Pelt brought attention to the archetypal college basketball fan of a bad team who maybe cares too much. 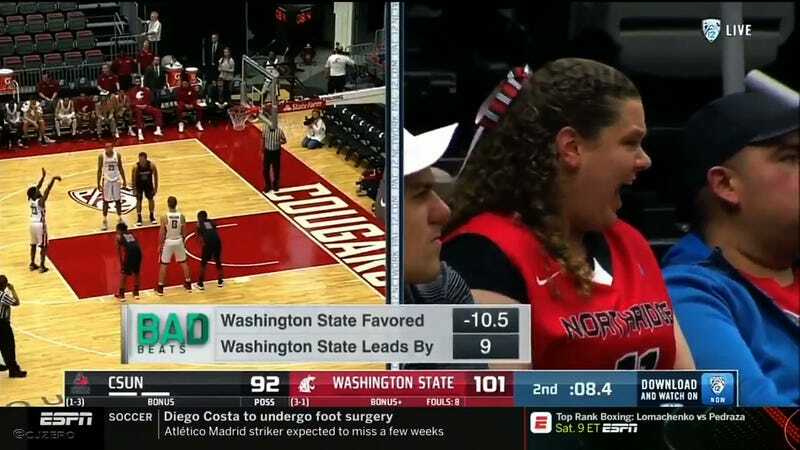 This shrieking Cal State Northridge fan was trying her best to pierce the eardrums of Washington State players—as well as everyone in the stadium, all the citizens of Pullman, and possibly every resident of Washington—on each opposing free throw. It was an awful sound. Let us hope that the Mark Gottfried era for the Matadors is as uneventful as the Reggie Theus era, so an NCAA Tournament crowd is never subject to this punishment. A College Basketball Insider Is Uniting Mid-Majors To Bust The Big Guys&apos; NCAA Tourney "Cartel"